Last week I had a chance to use my first ever Groupon. Earlier this summer when hunting for the Pajama Baking Company, we had walked by Kaos Pizza on Old South Pearl Street and thought that we would need to go back sometime. 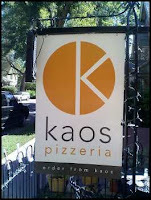 They have a great garden patio and the food was delicious! 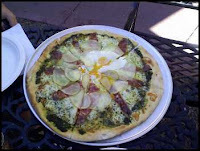 We had the Soprasetta Pizza, complete with an egg. Today I went in pursuit of something else local - a non chain coffee shop in my general area called Cariño Coffee. I've driven past it many times and they have a sign saying "Aurora's Best Coffee", so it was definitely worth a try. The staff was super friendly, when I said that I had never been there before, they asked what I liked and offered menu suggestions. I ended up with the Latin Mocha....very tasty. I sat out on the patio (complete with a dog bowl, so next time I'll bring Chey) and cracked open the new book by Robin D. Owens. Makes for a happy Saturday.